THE Grahamstown community is reeling in shock at the mystery murder of an Anglican priest who survived a gruesome attack by two men on a countrywide killing spree in 1991. Clive Newman, 45, a lecturer at the College of the Transfiguration in Grahamstown for the past four years, was found murdered in his room at the college residence yesterday morning. Newman was attacked in his car in Bluewater Bay 18 years ago. His throat was slit and one of his vocal chords was severed. His testimony helped convict Antonie Wessels, 31, and his 16-year-old homosexual lover, Jean Havenga. Newman was the fourth and final victim of the pair and the only one to survive. College of the Transfiguration rector William Domeris, who found Newman’s decomposed body, said: “I went to look for him in his room because he didn’t pitch up for class. In fact, he didn’t even come to church on Sunday but nobody was worried. We thought he was just sick. Domeris said he then called the police, who were still on the scene yesterday afternoon. Regarding a note left on Newman’s door, reading “Gone for the weekend, will be back on Monday,” Domeris said they suspected a crime although Newman had always “used the note whenever he went away”. Anglican Diocese of Grahamstown secretary Nobuntu Mageza said it appeared the note was not in Newman’s handwriting. The college closed early yesterday, because “everyone is deeply shocked by the murder”, Domeris said. Mageza, her voice cracking on the phone, said they were shocked at the murder. 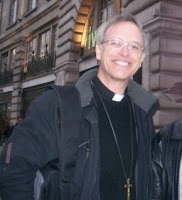 She described Newman as being “very excited about his ministry and working for God”. “People at the college say they saw a suspicious-looking person lurking around. They say they will be able to identify him. Also, Newman’s car has been reported missing,” she said. This entry was posted on Wednesday, November 11th, 2009 at 6:02 am	and is filed under Uncategorized. You can follow any responses to this entry through the RSS 2.0 feed. You can leave a response, or trackback from your own site.